In a picturesque location on the banks of the River Clyde, right next to the Zaha Hadid-designed Transport Museum, Glasgow’s Riverside Festival is fast becoming one of the city’s best music events of the year. While the sunny heatwave that had engulfed Scotland’s biggest city in the days prior to the festival somewhat gave way to a more humid and balmy forecast for the weekend itself, the summer showers failed to dampen the spirits of those in attendance. We were lucky enough to pop along and have a boogie – here are our highlights of RF17. As the Saturday afternoon ravers streamed into the festival site in anticipation of the headliners later in the evening, Slam – stalwarts of the Glaswegian (and arguably global) electronic music scene – provided more than ample entertainment in the meantime. The iconic pair cut a picture of concentration on the stage, quietly getting on with their business in providing an exemplary set of choice house and techno cuts that pounded through the speakers – the duo masterfully drawing in a huge crowd of listeners thanks to the pulsating ebb and flow of their mixes. 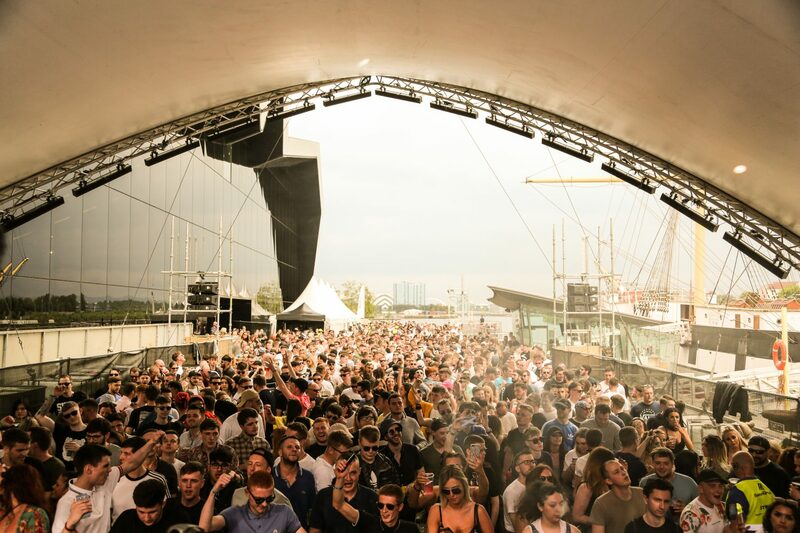 A few hours later – with the early summer dusk slowly descending – the Riverside’s already bustling atmosphere evolved into a fever pitch, as the world-renowned Nina Kraviz took over the decks for Saturday’s headline set. Playing to an absolutely packed out crowd, the Russian superstar’s set was an absorbing assault on the senses – with a colourful neon visual display of her playful logo combining spectacularly with bass-heavy tunes, providing a hugely popular end to the first night of the weekend. Unfortunately, due to their flight being delayed, we were unable to catch Groove Armada for a quick chat prior to them kicking off the second day of proceedings at the Riverside. However, their set itself more than made up for the disappointment, as the duo welcomed those arriving for the closing festivities by matching the welcome bursts of Glaswegian sunshine – with an energetic set full of vibrant and feel good tunes, with a remix of Candi Staton’s classic You Got The Love a particular highlight for all involved. The pair still remains hugely popular across the generations, as evidenced by the beaming faces of both young and old – a celebration of twenty years of expert grooving getting the final day off to the perfect start. Rounding off the weekender on the banks of the Clyde, both Scuba and George FitzGerald‘s B2B set, followed by the final headliner, Jackmaster – on his own Mastermix stage – provided an incredible end to the Riverside Festival for this year – bring on next time!